June (school) holiday is approaching! If you are still racking your brain on which good places to bring your children to, for some fun and valuable visits throughout the 1-month break from school, I have some ideas here. 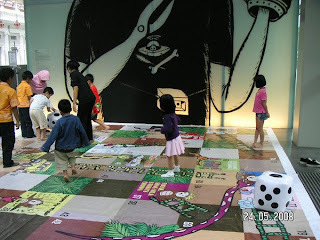 Go pay a visit at the Singapore National Museum, not so much on touring the museum, but to attend some children themed holiday programmes organised by the authority. And, there were free seminars on parenting, while the children could have some drawing sessions just located outside the seminar hall. It was not surprise that the events turned out impressively. It was not difficult to see the well response from the increasing crowd throughout the day as we were there since 11am till 3pm. This year, the children season programmed is back, again, from 23rd May till 7th June 09! Thank to the authority. This is going to be another beneficial visit to both the child and adult! 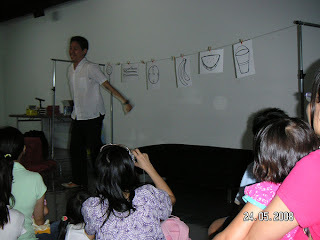 There are many different kinds of event, what I typically look for, is the Free Events for all ages (winking smile)! Intro: Bring your entire family as you venture into the world of nature and environment this holiday season with Young Cinema! Enjoy the inspirational stories and wonderful ideas from children films and animations from around the world. Young audience will get educated and enthused to love and protect the earth. Young Cinema films have been curated specially for an audience of age 7 – 12 years old. 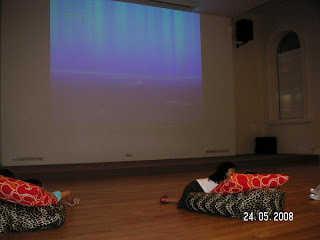 It was held in a spacious air-conditioned hall where you will be seated either on the floor or cushion (giant bean bag) to enjoy the young program in a breezy way (some chairs were provided, too). I guess it should the same for this year. Intro: A wonderful play area combining the creative elements of a natural garden-scape together with interactive components. This haven is a dedicated space for children to unleash their energy in positive ways. This event wasn’t there last year, but there was the giagantic “Snake & Ladder” board game well loved by the children. I guess the above program should be a physical and interative game that pretty much similar to the previous live-sized board game. Intro: Storytelling with Monsters Under the Bed is back for another sell-out performance at the National Museum of Singapore. Be thoroughly entertained with witty improvisations and interesting stories that will get you laughing to tears. Audience both young and old will get be able to interact with the storytellers and they “battle” each other with stories that are created by you. Well, beside those free events. I think you may also look out for their workshops which suit children range from 5 – 12 yrs old. These workshop with diverse topics, each costs averagely $25 per child & adult. It is good for mother-child, father-child bonding as you will get to work on an item together. The programmes during this children season is so extensive that you can spend almost whole day here, if your child and you are not overly exhausted by the overwhelming events. I wish to also bring this up, even I did not get myself the opportunity to participate, but it sounds so interesting to me. It’s about food! Yes, it’s my forte, my love and my soft spot! Go attend this, if you are not an early bird for events, it starts at 7pm. Intro: Arab, Chinese, Eurasian, Indian, Malay and Peranakan foods are extremely popular in Singapore today, but many of their original recipes are lost due to the unavailability of raw materials and a change in people’s lifestyle and tastes. The talk will offer a small sampling of such ‘extinct foods’ for a limited 60 participants only, so hurry down and be the first to find out more before it is too late! Since weekend is here, and tomorrow will be the commencement of these children events, bring your family and have some fun there!